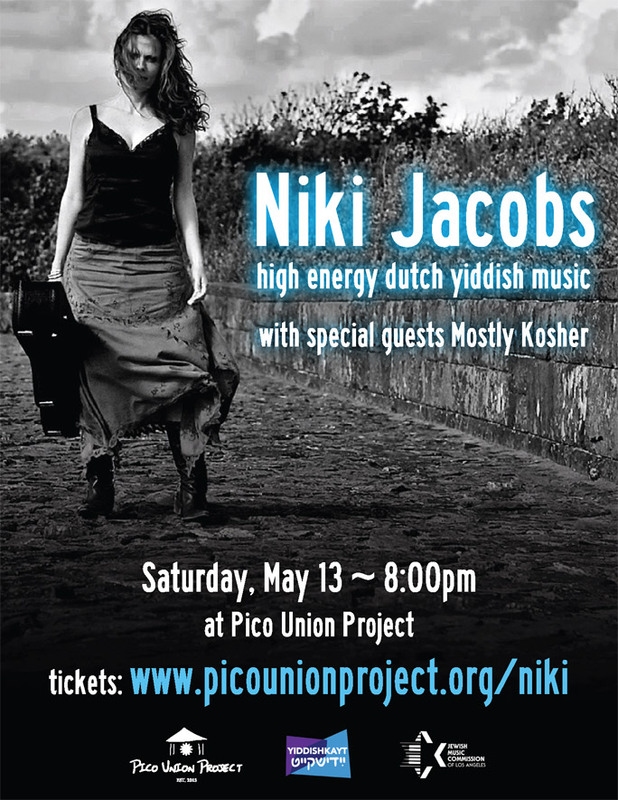 Niki Jacobs, founder of Nikitov, and her cutting edge band Nikitov will appear at the Pico Union Project on May 13th for their only west coast stop. For over fifteen years. Nikitov has wowed audiences around the globe with their quirky Avant garde take on Yiddish music. Inspired by her family history, Niki developed a deep love and passion for Yiddish culture and Yiddish song. Their arrangements, orchestration and instrumentation are all new, however, they are inflected with the sound of early Gypsy Jazz. 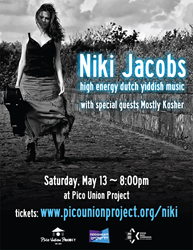 In 2009 Niki began composing new Yiddish music, and shifted away from the influence of Gypsy Jazz. The concert, co-sponsored by the LA Jewish Music Commission and Yiddishkayt will open with a set by local Klezmer favorites Mostly Kosher.